Ah! Love is such an exquisite feeling. It melts our heart, and gives us a reason to live. I have been in love forever, and it has become my strength rather than weakness. When love becomes your weakness, it is not true because true love is built on trust, compassion, and friendship. When I talk about love, I find that there is no space for doubt. If your partner is not being true to you, that is their problem and not yours. When two people are in love, they should be truthful to each other and there should be no scope for doubt. 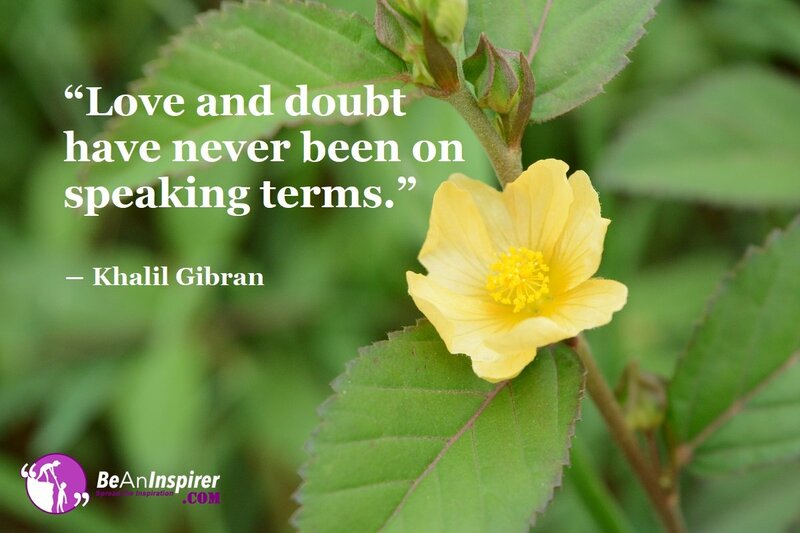 Do note that love and doubt can never coexist. When there is doubt, it cannot be called love. Let me give an example of a relationship where the partner did not trust his woman. He reached a point of madness that he lost her forever. Was she actually cheating on him or hiding anything? No! The doubt, fear, and insecurity were something which his mind created on its own. Why can’t you communicate with your partner? If you find that he/she is having an extra-marital affair, checking the phone or tapping his/her calls will not solve the purpose. If he/she is hiding something from you, they would be smart enough to delete all the messages, photos, and emails. I do say this with a lot of compassion that when in doubt, you must ask your partner. If your partner still lies to you, then they are the ones at fault and it is not love. At least from their side – it isn’t! Doubt in a Relationship: Toxic or Important? Doubt is not an important ingredient in a relationship. You cannot build a relationship on doubt and confusion. It is built on trust and once some fear or doubt comes to your mind, your relationship becomes toxic. There is no scope for doubt in a loving relationship because your partner will never make you feel unwanted. If you find that your partner is being distant or lying to you, then you need to sit down with your partner and talk about it. I have seen many women and men, who doubt their partners. Checking phones, stalking on Facebook, hunting down the ex-girlfriend or boyfriend and even searching Google for a trace of their partner are common practices that should be avoided. The spying and doubting is toxic for your relationship because nobody likes a nagging/needy girlfriend/boyfriend. In fact, I have seen marriages coming to an end because of doubt, confusion, jealousy, and insecurity. Love and doubt can never coexist in a relationship and it is time to work on yourself rather than going after your partner. READ ALSO: A Friend Is One Who Is Always By Your Side And Believes In Giving You Happiness; Own The Friendship Treasure You Have Received For Lifetime As Once It’s Broken, It Can Never Be Mended!! Doubt could be a hangover of the past experiences. Maybe you had a terrible experience in your past relationship and you do not want it to happen again. Doubt could also be a case of being insecure or unsure of you. Just mark my words that your past experiences should not be the basis of judgment for your present partner. If you love with all your heart, you must never doubt and in case anything is stuck in your heart, you must speak with your partner. I have seen people going mad because of insecurity, jealousy, and doubting. Doubt is the silent killer of your relationship and you wouldn’t even come to know when your marriage or relation ends! Stop being needy and love yourself because self-love is important here. When you love yourself, you do not think about the negative aspects. If you focus on yourself and give all your love to your partner, they will never leave you because everyone wants to be loved madly. Nobody wants to be doubted or commanded. In conclusion, you must know that love and doubt can never coexist. If you find yourself doubting your partner, drink a chilled glass of water and ask yourself as to what created this doubt!